Have you ever thought about having a firearm specifically dedicated for home defense? Shotguns and handguns are both suitable options. There may be some confusion about the way a firearm should be stored and safeguarded from children or anyone else who should not have access to it. Some argue that having a loaded firearm in the home is inherently dangerous, but securing the firearm in a safe, limits accessibility when a user most needs it. No matter what firearm or storage method you decide works best for your needs, there are some universal rules and techniques that can help you store your firearm in a way that makes it accessible to you, but not those who should not have it, like children or criminals. First let’s address the rule that the firearm should not be loaded until it is ready to be used. While this is true, the firearm we are discussing is your home defense gun. This gun (or these guns) is/are specifically dedicated to home defense. Their purpose is to protect your family and you in the event there is an intruder inside your home. Because of this, your firearm should be ready for use at a moment’s notice and should be loaded. Depending on the size and layout of your home, you may choose to have more than one home defense gun. Let’s be realistic; protecting against a home invasion attack with even moderately trained attackers is difficult. Unless you carry a firearm on your body at all times, the attackers will have the upper hand. It will be up to you to survive and to get to your firearm by any means necessary. Remember that your will to survive will ultimately give you the chance to prevail in any situation. Do not ever give up or give in. Let’s assume that you have made the decision not to carry a firearm on your body while you are in your home. How can you store your firearms so you can get to them quickly, but keep children and criminals from accessing them? There are some obvious options, such as a gun safe. This safe should not be the main safe you use to store other guns or ammo. The safe you select should be dedicated to specifically hold your home defense firearm, an extra magazine, and a small flashlight, if you do not have a weapon light. You do not want anything in it that would cause you to fumble while trying to get to your firearm during a stressful situation. 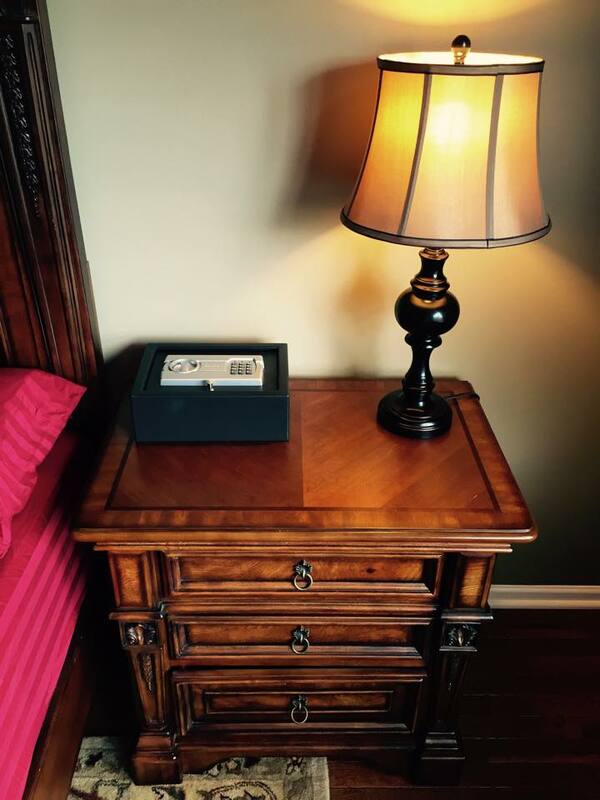 There are many different sizes and types of safes that are great for this specific purpose, some that even fit inside a nightstand drawer if needed. It is important to consider how you will access your gun inside. There are biometric safes that use fingerprints, radio frequency (RF) ID cards, rings, or bracelets to open them, and others. All of these have their own limitations due to the mechanism being made active by technology or electricity. There are a few reputable companies whose biometrics seem to work better than others, but none are perfect. Just like the electronic safes that use a pin code to open, there is a chance that you could have a dead battery. The good safes have a low battery warning, so if you keep good batteries in them you shouldn’t have an issue with this. Additionally, you can usually program multiple users on the safes that use fingerprint ID, which is great for those of us with more than one adult in the home. If using a biometric type, I also recommend that when inputting your fingerprints in the system, you input your finger several times at slightly different angles. This will ensure that if you are stressed and don’t place your finger in the most optimal position, you have a better chance of your fingerprint being recognized. For obvious reasons, these types of safes are quicker to access than a keyed safe. Finding your key quickly can be stressful and can slow your ability to access your firearm. There are safes that can be mounted under desk tops, and safes that are vertical and slim that can fit in between your bed and nightstand. There are so many options and configurations of safes, that it is not difficult to find one that fits your specific application. Some safes are somewhat of a hybrid between concealment and a traditional safe. These can be mounted between studs in the wall and covered by mirrors or artwork. Or, you can use the ones that look like air conditioner registers and are large enough to hold a bigger firearm. These may be a good option in main areas of the house where you want a firearm nearby, but don’t want a safe displayed, or don’t have a drawer to place the safe in. There are also a few really amazing products that move one step away from the safe and more toward concealment. These function by hiding your firearm in plain sight. By searching concealment furniture on the internet, you can find several companies that produce quality desks, entertainment stands, tables, and shelves that have hidden compartments designed to hold a firearm. Some of the compartments are only accessible after a magnet is placed over the locking mechanism. These are obviously not as secure as a locking safe, and you should consider this based on the people living in your home. These furniture pieces are so innovative and many are large enough for larger firearms like rifles and shotguns! These are also great options if you would like to conceal multiple firearms in different locations in a large home. After deciding where and how you want your firearms stored, it is important to train everyone who is going to have access. Make sure they know how the safes or concealment furniture work because you will need to know how to access them in the dark or in the light. You may consider placing a night light near the location to help with accessing your firearm in the dark. As responsible gun owners, we never want children to access our firearms and injure themselves or someone else. Additionally, if we have family members or friends who are prohibited from owning firearms, it is our responsibility to secure them. With all the options for securing firearms, there should never be a reason to leave a loaded firearm out in the open, tucked under your mattress, or in a drawer. If you insist that you need a loaded firearm within reach at all times in your home, you should carry your firearm on your person. This is really the only way you will have instant access to your firearm at all times. The real question, is once you have your firearm in hand, do you know how to use it? Not only is proper training a must, there are different scenarios that may not require the use of a gun. We put together a short video on how to open the door to strangers for FREE. It changed the way I look at the front door, and will for you, too. We actually have a safe with a key entry and pin pad…. Pin pad batteries are dead (replacing ASAP) but we have the key put in a different location, albeit close to the safe, but in the instance of a home invasion, I’m not confident I would be able to calmly, quickly, and quietly access my firearm with the current set up. Good to know there are other, family safe options out there! Thanks for the article! Amanda, Great hearing from you! As you know, I am a huge safety guy, especially when it comes to safeguarding children from accessing firearms. So glad you also are responsible and actively protect your kids and any other little ones that may come over your house! Stay safe and thank you so much for the feedback! Sgt Maruster, thank you for your military and civilian service to our country. Good article, but how about trigger locks as an option for keeping a home defense firearm safe? They are secure while still allowing for relatively quickly access. While they don’t offer any real theft protection, they will allow you to keep a loaded firearm in a nightstand for example. Trigger locks can come with a key or some with 3 digit dial locks. Thank you, David! Very good point about trigger locks being an option. I would qualify that with (like anything else) make sure it is a well-designed product. I have seen some trigger locks that actually still allow the trigger to be pulled. Also, some are designed to be used on an unloaded gun. But if you have a good trigger lock that allows you to keep the gun loaded, trigger protected and easily accessed (by an authorized person) it is definitely something that could be beneficial. Thanks for the feedback!